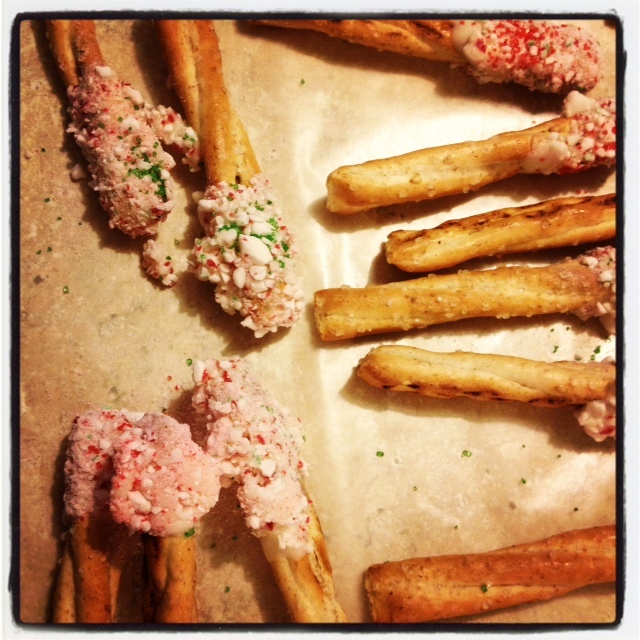 Chocolate Peppermint Pretzels & More! I needed to make some simple gifts for neighbors and the Kilpatrick Family (because they are seriously like a surrogate family to me, and they are amazing people), and I really wanted to do something where Jack could help. 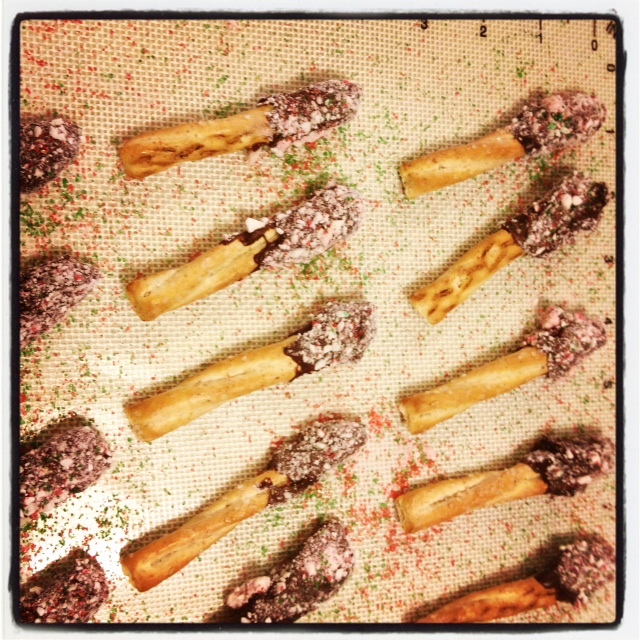 I figured these chocolate dipped peppermint pretzels would be the perfect solution. 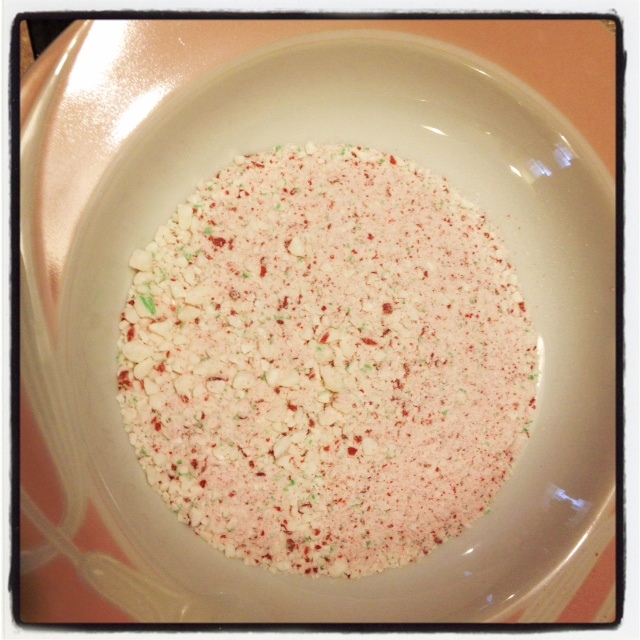 Peeled candy canes, ready to be turned into minty dust. I used two different colored candy canes (traditional and ones that include green), peeled them, and then separately gave them a good crushing in my food processor. When each was done I poured them into their own shallow bowl. I got 2 bags of the honey wheat pretzel sticks. They are a good, medium length. I melted (separately) white and semi-sweet chocolate chips in a double boiler. When they were all melty, I put the bowls at our workstation and we got to dipping. 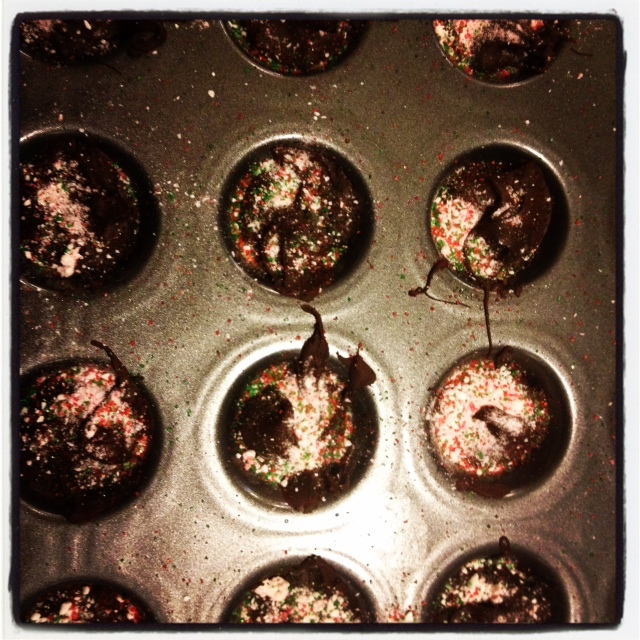 After we dipped each one we rolled it around in the peppermint crunchies, then we set them down on a huge silicone mat. You could also use wax paper or parchment paper if you don’t have a silicone mat. At the end we took red and green colored sugar and sprinkled it on them, then waited for them to dry. I realized when we were finishing up the pretzels that I still had lots of melted chocolate left. Since wasting food makes me feel nutso, I knew I had to figure something out. I got out my mini muffin tin, spritzed a little cooking oil in the bottom of each space and then started pouring the melted chocolate in. I quickly sprinkled the leftover peppermint and sprinkles on, then stuck the whole pan in the freezer for about 30 minutes. If you don’t have a mini muffin tin you could use a regular one, but the disks would just be thinner and wider. They may also be a little harder to get out so silicone muffin cups might make things easier if you have those. When I pulled the pan out I let it sit on the counter for a few minutes before carefully popping them out. I put them in little baggies and I’ll be giving them as gifts. For the pretzels I got some inexpensive containers to package them in. I found a set of green plastic containers and a glass jar with a hinged lid. The glass jar was less than $3 at local dollar store! 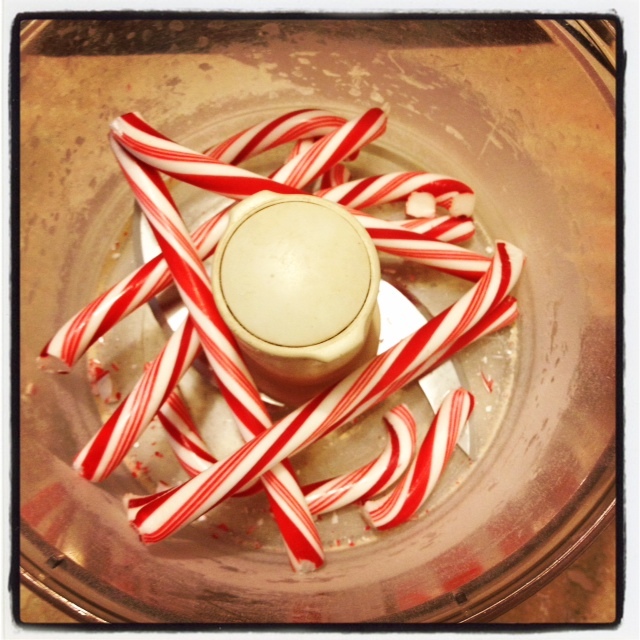 When I filled them I put some candy cane striped ribbon around the top and then little “To, From” labels on the top. The whole project didn’t take more than a couple of hours and it was really affordable. This would also be a great project if you have kids of multiple ages, because even though they might not be able to all the steps, even just putting on the sprinkles would be fun. So if you are scrambling for any last-minute gift ideas definitely give these a try! This entry was posted in cooking, creative projects, family fun, food, kids, seasonal recipes, Uncategorized and tagged Christmas, gift ideas, holidays on December 19, 2011 by Erika T..
Our first real Christmas here (we first arrived just a few weeks short of Christmas, so that one doesn’t really count in my mind) we only had a few friends in the area. I whipped up a few spice rubs for our friends and neighbors, got a couple gifts for Chris and Jack, and that was about it. Now we are fortunate to have lots of awesome friends, and since I love making stuff (duh), I want to make all sorts of nifty things for them this holiday season. Here’s the only problem….I swear it’s sneaking up on me faster than ever this year! I really should start planning this stuff in the summer. I know that sounds bonkers, but some things take longer than others to make and can sit around for a few months before Christmas. 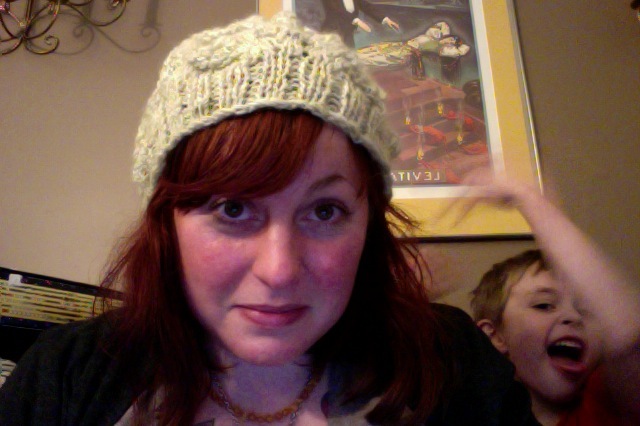 I’m referring mostly to knitted/crocheted/sewed things. 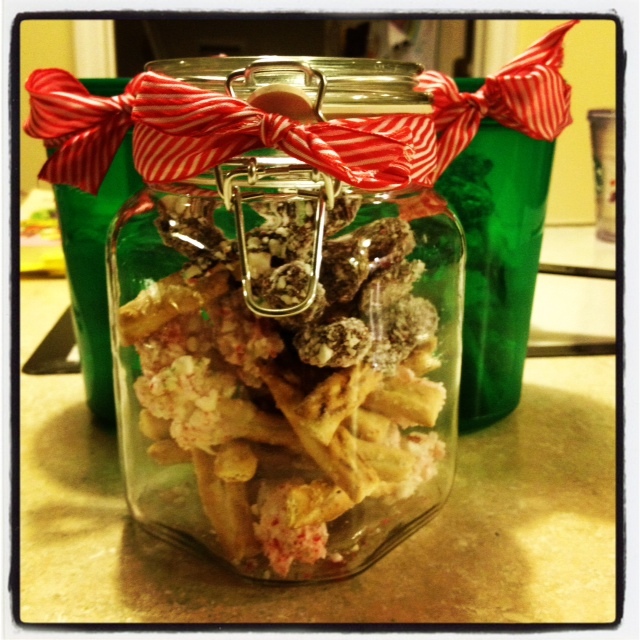 Also, I should stretch my canning endeavors to include extras for gifts. I didn’t really think of that this year. Ooops. Then there are the things I have to make right before gifting, such as edibles. Now, I obviously can’t make these whenever I have a free moment, since I have to make them right before I give them….but I should’ve been thinking about these recipes back in October! Again, I know this is making me sound like some crazy Martha Stewart nutcase, but not all my friends like the same edibles, and with food restrictions and allergies, I can’t just make one big batch of something and dole it out to everyone. I actually need to sit down with a list of people and make notes next to it. In the end, I know it will all get done, and it will be fun to deliver everything. But seriously, next year, in the heat of the summer (when Chris starts singing Christmas songs because he’s weird like that) I’m going to get out a pen and paper (and login to Pinterest) and get crackin’ on planning. This entry was posted in canning, cooking, crafts, creative projects and tagged Christmas, gift ideas, holidays on December 8, 2011 by Erika T..
Jack loses his mind whenever I turn on Photo Booth. That's the new hat. I should probably be making stuff for my friends and family for Christmas right about now, but instead I made myself a new hat. I had some yarn from the Southern Adirondack Fiber Fest that I still hadn’t used and recently donated some of my older crocheted hats, so I searched on Ravelry for a good pattern. I wanted to find something I had all the materials for so I could start it the same night. I was also very tired when I started and wanted something simple and a pattern with familiar stitches. A few had stitches I hadn’t used before, and although I’d love to learn them at some point, this week was not the week for that. I found this pattern and it fit all the criteria perfectly. I didn’t want it quite as slouchy (plus I was afraid I’d run out of yarn) so I only did 2.5 repeats of the fish scale pattern. I also added a knitted row in between each decrease row at the end. It only took two nights to complete and I love it. Now I’m finally getting around to making this Acorn Head scarf/hat combo thing. A friend was making them last winter but I just never got around to it then. I’m frogging a cardigan I made that came out way too big in order to use the bulky yarn from it for this project. After that I think I’m going to try to make a few gifts for people. I may even make an Angry Birds beanie for Jack as a surprise. I am not in love with any of the patterns I’ve seen for it, so I’m pretty sure I’m just going to wing it and make up my own. I should really plan this stuff out better earlier in the year. Dang Christmas, creeping up on me like that. This entry was posted in crafts, creative projects, knit on December 7, 2011 by Erika T.. The understock is so beautiful it almost makes me cry. I'm glad I actually have some photographic proof of what I used to do. *If you tinker with DIY stuff from time to time, you may not find this super helpful. However, I find in order to really have the time for all the projects I love (and there are many! ), I really have to streamline the stuff I hate (cleaning, organizing, etc.). 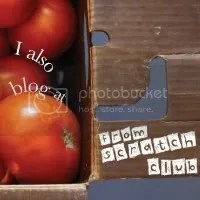 For the past few months I’ve been trying to be more mindful about what needs to get done to make our house a Happy Home and I’d like to share that here. By no means is any of this a perfect fit for everyone, but if it helps you find the time to make some awesome homemade bread or knit yourself a scarf, all the better! These past few months I’ve been trying to use skills I learned when I was a boss outside of my home, to being a boss inside my home. I’m always trying (and a lot of times failing) to not be bossy (especially with Jack), but I also think a lot of things work well in both environments. 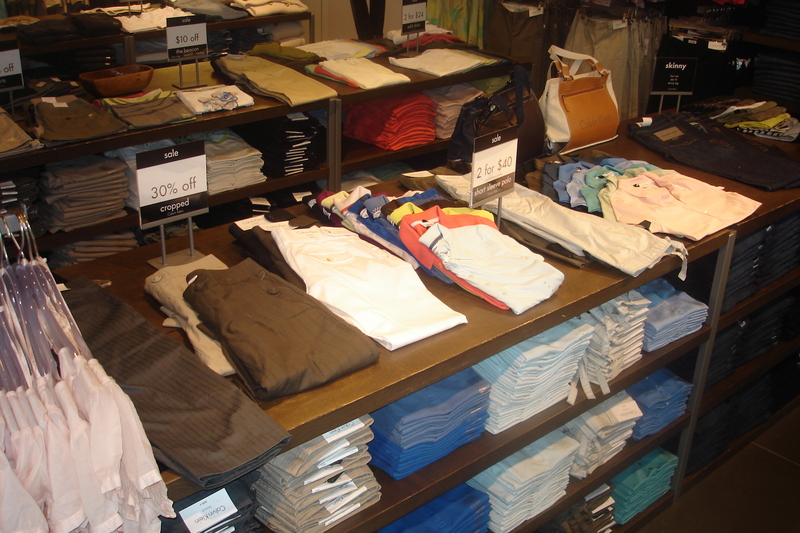 For instance, when I worked at Calvin Klein we had certain things we did each day of the week, almost always. This made things run more smoothly because all the things that had to get done each week were assigned to their own day. By week’s end, all the important stuff had been taken care of. Generally speaking, I try to get a huge chunk of house stuff done on Sunday and/or Monday. Lots of chores and weekly prep cooking (ex: making bread dough, granola, tortillas, etc.) get done on these days. It makes me feel like I’m starting the week off on a good note when I have a clean house and a head start on meals. Other days we already know we have things to do (art class, trip to the farm, 4H), so those get penciled in, and other things get worked in around them. I am not to a point (I’m not sure if I’ll ever get there) where I’m super strict and assign a specific chore to each day of the week. I just try to keep track of them mentally, and get them done at some point during the week. As Jack gets older I’ve been trying to delegate certain tasks to him. He now has to vacuum his room each week, and organize the shoes by the door each day. The older he gets, the more chores I will teach him how to do. Delegation is crazy important as an effective boss, and there’s no way I’m doing all this nonsense through his 18th birthday! I’ve also been trying to think of other things that may help too. For instance, I’m really going to start trying to finish certain things up before bed each night. Every properly run business (I’m speaking mostly about retail/service stores here) has a “closing checklist.” There are things that simply must get done before people can leave for the night. I’m pretty sure if I just drag myself off the couch earlier at night, I can eek out an extra 10 minutes to load the dishwasher. I know it will make me feel better to not look at a sink full of dishes first thing in the morning. Again, I know there will be nights when I’m just exhausted or weeks that everything goes bonkers, but then again, I’m not going to get fired if I take it easy from time to time. After all, I want my home to be a place I can relax and not feel super stressed out over. However, I do think a lot of workplace skills can transfer well into the home. Do you have any great tips for making things run more smoothly at home? This entry was posted in Uncategorized on December 1, 2011 by Erika T..